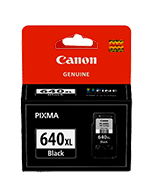 For instance, the Canon PG-640XL Black Ink Cartridge has a yield of approximately 400 pages @ 5% coverage. In addition, keep printing costs $ low. As well as, maintaining productivity with genuine Canon Inks.